And what about our other child? The black one. 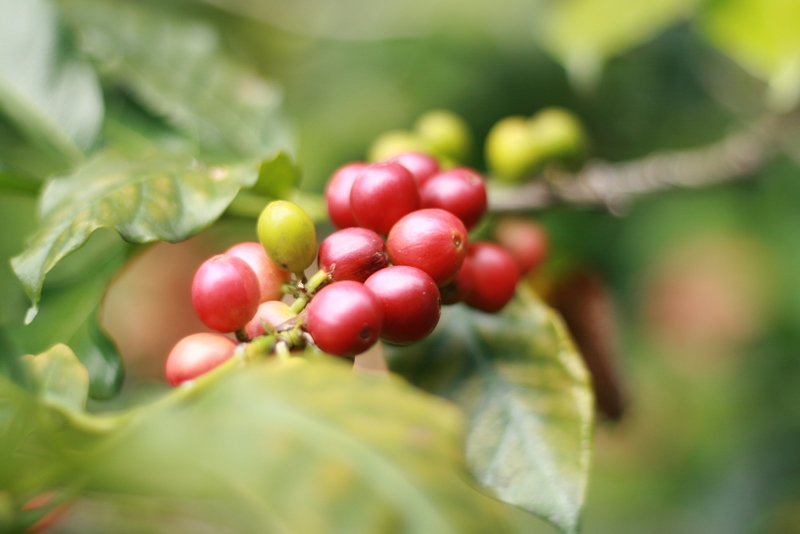 The one we have been nurturing for over two years now…Our beloved Coffee!? A few months ago we have completed our first coffee harvest and started the process that led us to our very first cup of home-grown coffee. How special. I am so happy that at the beginning, when we first bought our land, we had the foresight of planting coffee and fruit trees as the very first thing after fencing in our parcel of land. We selected the part of it which wasn’t really suitable for building and whilst Fintan was in UK I was busy trying to sieve through all the information and tips locals were throwing my way. I remember it being overwhelming especially when I picked up advice from foreign permaculturists which clashed with local traditions. 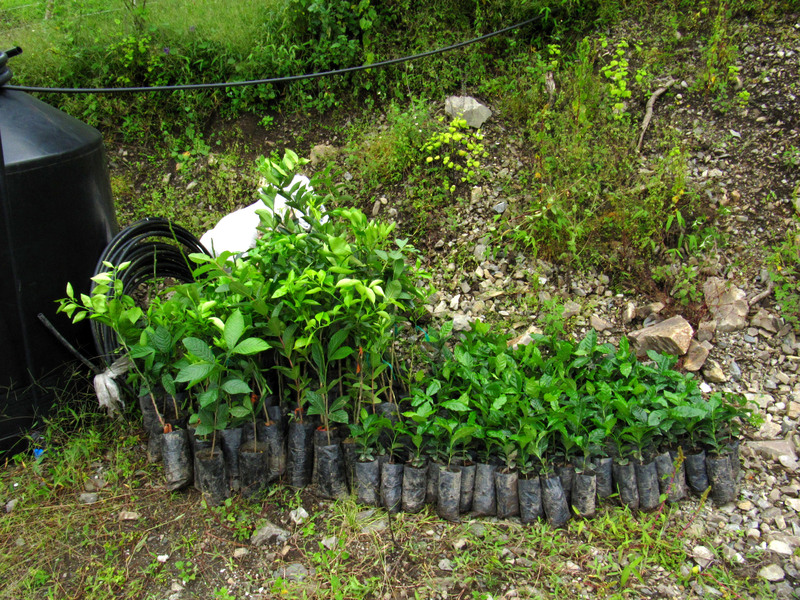 Almost 500 plants were put in the ground then, and have now grown to be lush healthy bushes, continuously bearing fruits. It has a meditative quality about it. Going from plant to plant, popping the fruits off their vigorous branches with eagerness and seeing my basket filling up with Roman red sumptuousness, all with an empty mind, solely dedicated to the task. Everything else shuts off. Except the sound of bees and birds, of the ruminating cows nearby, the swishing of the eucalyptus trees. No thoughts. Just the sudden jolt of surprise every now and then when discovering an unnoticed cluster of juicy berries hiding behind those rich shiny green leaves bearing the flavour of Christmas. Or maybe is just the resemblance of the coffee plant to the holly bush what takes my mind to past Christmas mornings. We have learnt that you must pick only the very red berries leaving behind the half red half yellow/greenish ones until they fully mature into that beautiful scarlet tone. Locals don’t seem to care much. 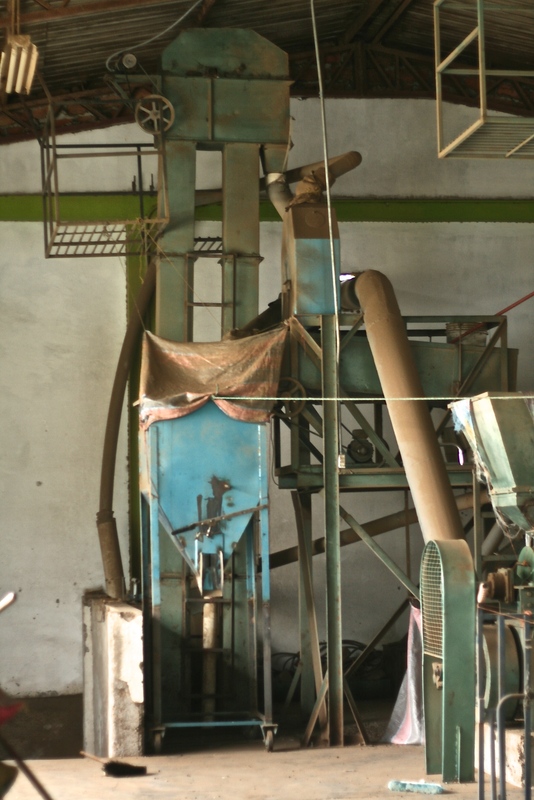 They only want to pay one set of workers to pick coffee at each harvest time so they pick whatever looks reddish. Instead, we have been very pedantic about this rule and for the past nine months we have had multiple harvests. The last one I can remember doing myself was when I was 8 months pregnant and I was sitting down on our plantation steep slope and shifted around on my bum with my woven basket diligently picking only the reddest berries. I was keen on getting all this done whilst Fintan was away and realised how difficult I found it all. Fintan makes it look so easy when he organises work, delegates, makes decisions.I was so retarded about the whole thing! But that made me learn a lot and now here I am, sipping on an almost illegally-strong cup of our own coffee, looking back and laughing at my novice self back then. 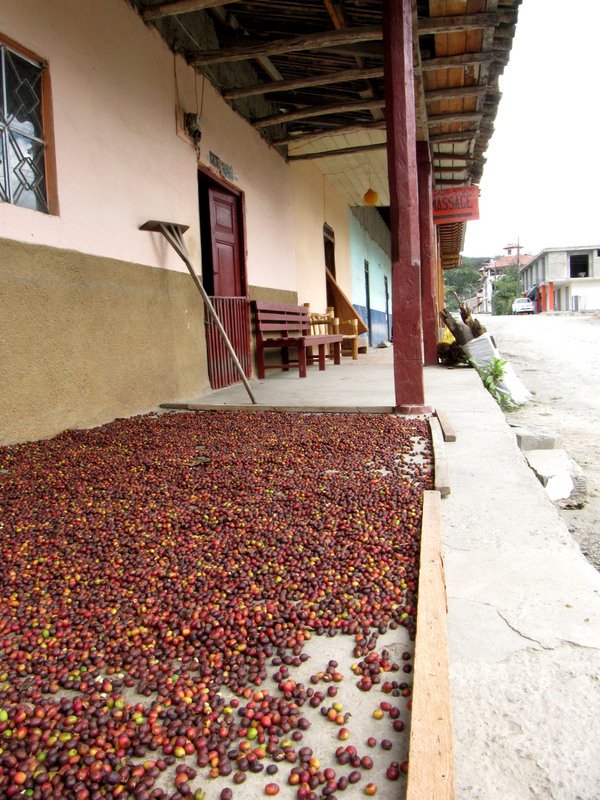 One of the little things I am captivated by these coffee farming villages like Vilcabamba is that is very common to see coffee drying outside people’s houses, like a carpet of fermenting-smelling coffee marbles under their porticoes. Berries are thrown in makeshift frames directly on the floor and let to rest there, being tossed around every day with a big wooden stick-tool until the berries are all dried out and turned a dark brown. Once all the berries have dried, peeling them is the next step. Tradition sees people putting the dried berries into a hollowed tree trunk and then punch them with a big baton until the hardened dry berry skin falls freeing the two halves of the coffee bean which at this point are a sage green colour. For huge bulks and not so tradition aficionados, professional places with peeler machines are available and would peel your coffee in a few hours. This is what we did.We paid $10 to have two big sacks of dried coffee peeled. Roasting your beans comes next. 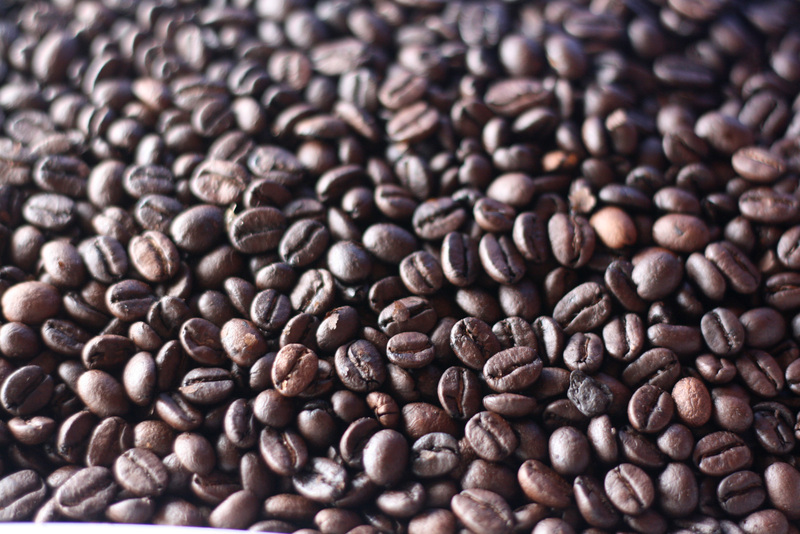 Coffee can be sold fresh, dried, peeled, roasted and ultimately ground. Different prices applies according to what stage you decide to sell it at. But considering the amount of coffee Fintan and I alone drink and accounting for all the people we promised our coffee here and at home…well, selling it it’s out of question! We sent 10lb at the time to my former colleague and neighbour Doña Lucha who has invested in a coffee roasting machine. We paid $2 to have it roasted and have half of it ground too. 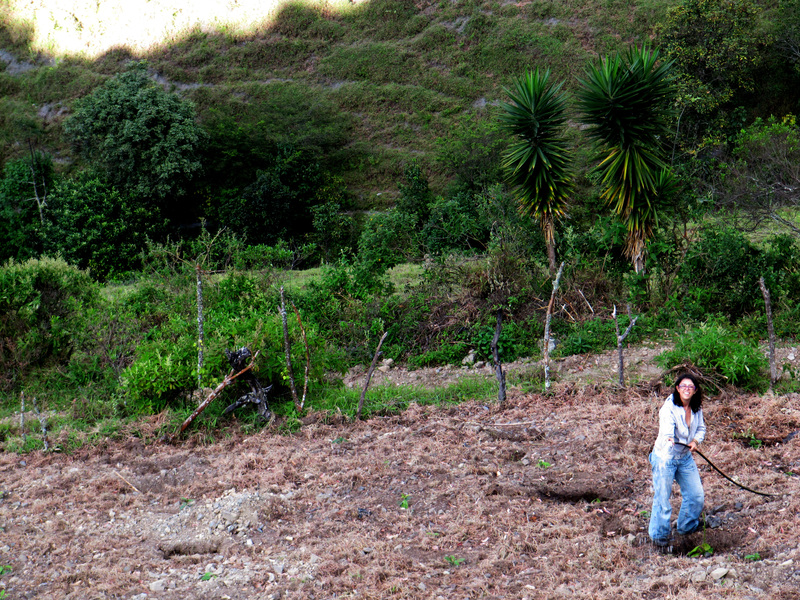 Her coffee was the best coffee we have ever had in Ecuador and guess what? It comes from her land 100mt before ours! 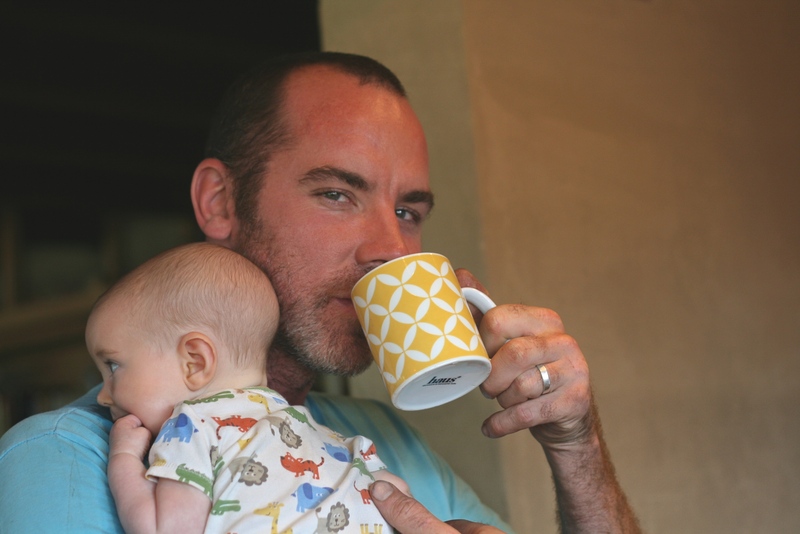 Drinking coffee in the morning has now become more than a ritual. Almost an obligation. A day is not a day if it hasn’t been blessed with a cup of coffee first. More than ever before. The dread on Fintan’s face that time when he realised we had run out of coffee deserved a photo. And a psychotherapist perhaps. He’ had a cup of tea instead and with exceptional misery he said “it’s just not the same”. I am usually in bed by the time he prepares coffee, enjoying Camila’s morning blabber and alligator moves as she frees herself from the blankets.And then that vodoo smell seeps through the keyhole of the door and underneath it and swims through the bedroom’s sleepy morning cool until it finds an overjoyed welcome in my nostrils. Then is when I know the day has started. As I try to put Camila’s rythm into a routine, I realise the morning coffee is the only one I am truly successful at. I am a former Supertramp after all. 22 Jan	This entry was published on January 22, 2015 at 3:18 pm and is filed under coffee, Ecuadorian culture, Rural life, Uncategorized. Bookmark the permalink. Follow any comments here with the RSS feed for this post.